Unmarked Holocaust Killing Sites | Remembering Litvaks, Inc. In March 2017, the Rokiškis Regional Museum’s historian, Giedrius Kujelis, notified us that several Holocaust massacre sites in the Rokiskis region are known to local residents but have never been formally identified, let alone marked and placed under legal protection. We have encouraged the museum to use the funds we have donated for research to document these sites by physically examining the locations with witnesses, gathering their statements, and obtaining any other relevant information. The first site to be documented is near the road leading northward from Kamai / Kamajai toward Rokiškis, where a temporary detention camp for Jews from the region had been established on the grounds of the Tyzenhaus manor. Some of the more prosperous Jews from the town of Svėdasai were being transported with their possession to the camp on horse carts by ethnic Lithuanians from Svėdasai. En route, the captors murdered the Jews and plundered their property. After confirming that the site has not been known to Lithuania’s Holocaust Museum (the “Green House”), Yad Vashem, or the U.S. Holocaust Memorial Museum (“USHMM”), we encouraged the Rokiškis museum to investigate the facts and document their findings. On June 20, 2017, the Rokiškis museum formalized its documentation of the facts, which the museum will forward to Lithuania’s Genocide Commission. We have translated the documentation into English and, with the Rokiškis museum’s approval, we provided the Lithuanian and English versions to the Green House, Yad Vashem, and the USHMM. In a press release issued the following day, the museum announced that it was working with two local groups in Rokiškis to document a second unmarked killing site. That site, just to the west of Rokiškis, is where the young Lithuanian-Jewish poetess, Matilda Olnikaitė, her family, and a related family were tormented, robbed, and murdered. It is hoped that eventually these and other sites will be marked and protected by law. 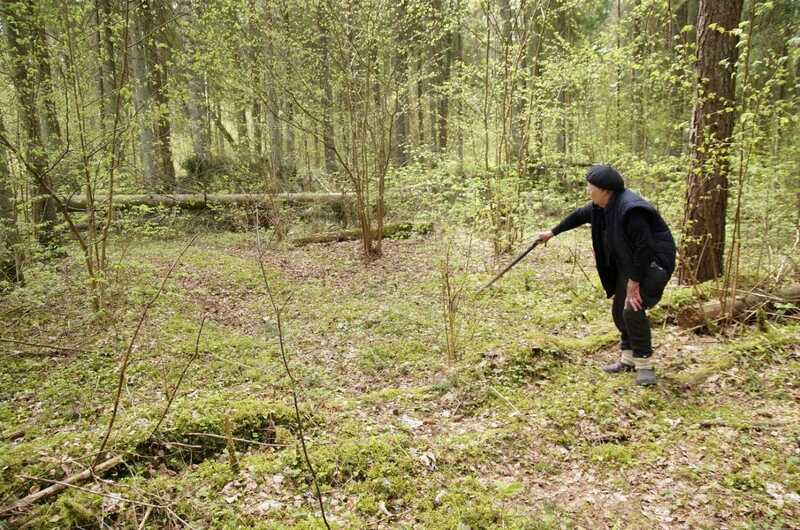 Local resident Jonas Rudokas showing Marijona Mieliauskienė, the Rokiškis Regional Museum’s Deputy Director, the location about one kilometer from his home where the murdered Jews of Svėdasai were shot on the outskirts of Trakas-Pempiškis forest, near the road leading from Kamajai northward to Rokiškis. Mr. Rudokas’s wife, Aldona Rudokienė, showing where those killed were buried.